Active: Available and expanding our stock in this fabric. Phasing Out: Available for now. Get it while you can. We still have some fabric in our inventory, but we can't get much more. Solid Combos: We are making more and more products in these solid combinations so that you can more easily mix and match patterns and accessories over time. Solids: We offer these colors in all Fleece Flippers and Cases as well as Fleece Forests and Flippin' Fun Futons. 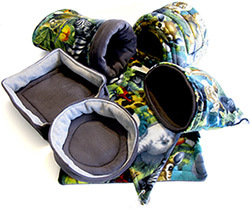 Other accessories and cozies are made in the Solid Combo's referenced above. Discontinued: Available as shown in various stocked items, but we have no more of this fabric available. Gone: A past fabric, no longer available in any items, although you may still see some photos of it in various places. Please note that some fabrics may occasionally vary in shade or tone. We have no control over the batches and lots from the manufacturers. It is the nature of the process and business. We cannot be responsible for perfect matches. We have items made and stocked at different times. We do our best, but simply cannot guarantee perfect matches while at the same time offering literally over a thousand combinations of products and fabrics. Thank you for understanding. PHASING OUT: Available for now. Don't wait to buy. DISCONTINUED: Limited pre-made stock until gone. GONE: Sorry. These patterns are no longer available. We now work directly with some fleece suppliers and have made special arrangements to keep certain patterns in stock as well as getting some fantastic new patterns that are virtually exclusive to us. This is very exciting. We currently carry over 50 fabrics! We periodically add new fleece and let some others go--keeping it fresh for you. Why don't you have even MORE fabrics? Fleece is manufactured overseas; there are no US suppliers and not all fleece is created equal. We source our fleece from high-quality manufacturers. Finding great patterns with enough volume that will be available to us for 6 to 18 months can be a challenge. All but the most standard of patterns gets discontinued and phased out over time, some quicker than others. We do our very best to lock in your favorites. You offer HOW many items? With 50 fabrics and around 20 products, that's a combination of 1000 unique items that we strive to offer you! And when you order, you want it NOW! We all do! We ship orders within a few business days on average. No long wait times for "custom" orders. Some products are sewn-to-order and many are stocked ahead of time by our team of wonderful seamstresses and crafters across the country--always hand-made with love to our high quality standards in the US.